It’s taken a while but I’ve made it to 200 posts! Here’s hoping we all stick around to see my 400th post ❤ Thanks everyone for reading! I’ve been gone for almost two years but I’m back. The blog has recently undergone some major work; a few touch ups here, some major reconstructions there. The blogs name has changed. This has been something I have wanted to do for a while but couldn’t think of anything better. The idea was to have something that addressed the fact that I don’t tend to review things so much as talk about how I am experiencing them or just enjoy them. I hope you like the new name and that Ally’s Appraisals fits the blog content more. I have changed the blog theme and am working those feature images and slider bar. The Currently Consuming and Small Snippet headers have been reworked into something smaller and I what I think looks better. I have no promised on the types of content or the frequency of the posts but I will be making an effort to keep this blog updated and relevant (if only for resume purposes). I look forward to writing more posts and getting back to engaging with the blogging community again. 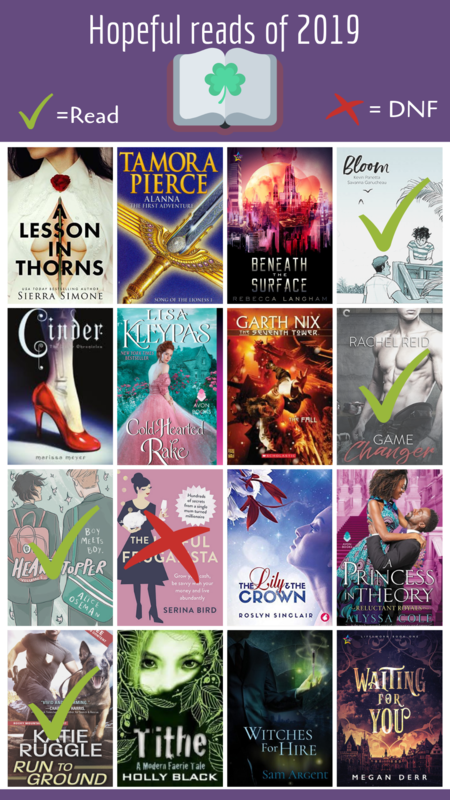 My recent Book Bingo post was the first one in a while, the first in three months to be exact. Of all of the excuses I could possibly give you, I find that my actual reason is the best: I recently made the transition from casual to full time work and I have just found myself so exhausted. So once again I find myself offering so many apologies for neglecting the blog but I am afraid my desire to veg and watch Netflix once I get home will probably continue. However I will strike while the iron is hot, that is to say I am feeling inspired, and try and set up a backlog of posts. I am even going to take my notebook on the train now and try and get some posts written that way. So I look forward to posting in the fortnights to come! Over the last month I have been having a little break, but you can look forward to a few changes in the upcoming months. I mentioned in January that I wanted to change the name of the blog and at the moment I am giving this serious thought. Hopefully in the future you will see an unveiling of a new name and all the fun of the changing logos. To make my life easier I am also cutting back on the Currently Consuming posts, ideally I would do one every week but the new plan is for one every fortnight. I feel that a more structured posting schedule will make it a tad easier to stay up to date. I hope you have as much fun reading my posts as I have writing them.